Ocean Dimensions has established its dive centre at Kihaa Maldives, the closest resort to the Maldives’ only UNESCO Biosphere Reserve of Hanifaru Bay. After many successful years in the Laamu atoll, Ocean Dimensions relocated to Kihaa Maldives this month and began calling the Baa atoll their new playground. At Kihaa Maldives, Ocean Dimensions will have some of the best dive sites in the Maldives on their doorsteps, with the famous Hanifaru Bay being the highlight for manta snorkelling. Ocean Dimensions is led by experienced divers Marc Zaalberg and Petra Hellmann along with a team of professional diving instructors. The award-winning dive centre offers PADI diving courses along with snorkelling excursions to Hanifaru Bay. Set within the sparkling waters of UNESCO Biosphere Reserve of Baa atoll, Kihaa Maldives is located on a picturesque 600m-long island festooned with jungle foliage, a white sandy beach which stretches the entire circumference of the island and a lively coral reef. There are 124 villas combining contemporary and classic features such as elegant furniture, romantic four poster beds and exotic rattan lounge seats. Guests can enjoy local and international dishes at the on-site restaurant or arrange for a romantic private dinner on the beach. 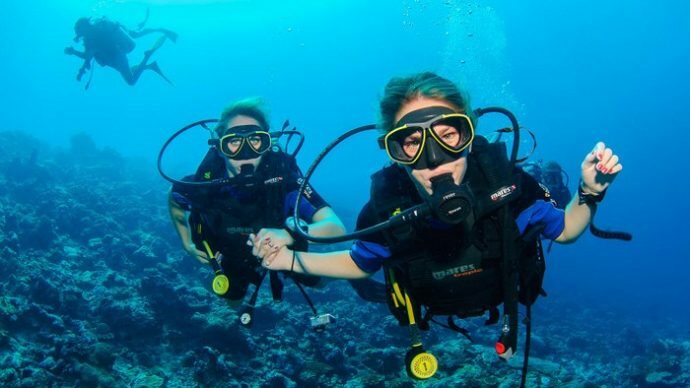 Scuba diving is one of the most popular activities at Kihaa, which is accessible by a 20-minute domestic plane ride from the main Velana International Airport. Guests can explore the area’s top dive sites featuring mega fauna including whale sharks and manta rays, and also visit the famous Marine Protected Area of Hanifaru Bay for snorkelling.